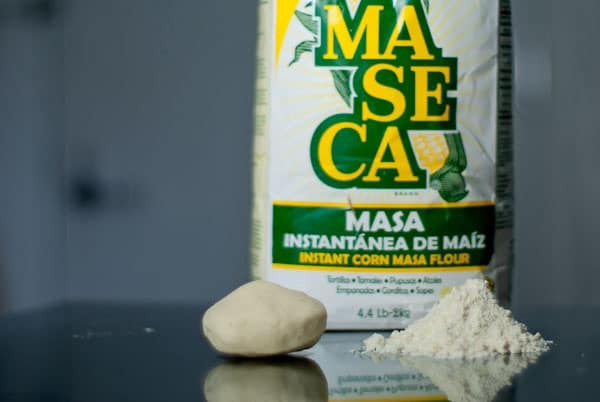 Masa Harina literally means dough flour in Spanish and in Mexican cuisine, it refers to flour made from maize that has been soaked in lime water (calcium hydroxide). It is not the same thing as cornmeal and cannot be used interchangeably. The process of soaking the maize in lime water softens the kernels changing the texture so that the finished dough is more elastic and workable. After the maize is soaked, it’s ground then used fresh as masa, or dried to make masa harina. In the photo above you can see the fine almost white powder on the right with the dough it forms on the left. In the back is a bag of Maseca brand Masa Harina. It has a nutty slightly minerally flavour that unsurprisingly tastes like corn. Grocery stores in North America that have a Latin American food section should carry it. Otherwise go to a Latin American specialty food store. It typically comes in bags that look like a bag of flour. Personally I like the Maseca brand. There’s no season, but if you are able to find fresh masa, which looks more like a dough, the flavour and texture are better than rehydrating dried masa harina. Masa harina can be worked into a dough by adding water then allowing it to rest for about an hour to fully rehydrate. This dough can then be pressed into corn tortillas which can be “baked” on a hot cast iron skillet. These tortilla’s can then be used to make tacos or enchiladas or just served along side a stew. If they are cut and deep fried you will have tortilla chips. Masa harina can also be used to make tamales, although there is a special kind for tamales (para tamales) that has a more course grind than the kind for tortillas. The lime water used to treat the maize adds calcium and releases niacin from the niacytin which greatly increases the nutritional value of the corn. I didn’t know about this until recently, when you referenced it on your blog. I’m intrigued. Latino cuisine has a lot of catching up to do here in Vancouver. Hopefully this won’t be too hard to find. Thats a good piece of information. But I doubt whether this is avilable anywhere in Delhi (INDIA). I am an Indian & extremely interested in making some corn tortillas at home. It depends on what you’re using it for. I cakes it can be subbed out. If you’re making tortillas it cannot be substituted. Nope, masa has been nixtamalized which makes it bind together into a pliable dough. If you use corn meal it will not press out properly. I have a lot of corn so how can i make it ? What other items or ingredients do i need ? Hi Guys , Am a Puerto Rican born and raise in Calif but have a Spanish decendent , Eating Mexican foods all my Life . Now I reside in the Philippines for the last 8 years . I make some foods here but others i cant for the resources are very limited . So please help i need resourse that can supply me with the Items i need . I have been to other countries like malaysia but still nothing . No where i can find Jalapeno peppers only in cans . nothing fresh . . . . I usually take trips back to the US to pick up Mexican ingredients that just don’t have good substitutes. Other things like jalapeños I just substitute chilis I can get locally like Thai bird chilis. Masa is made with hominy, not corn, so I’m not sure you can turn your corn into masa. Otherwise do a search for “nixtamalize hominy” on google and some sites come up with explanations on the process. Hi. Im from South Africa but love Mexican food. Can one combine coarse cornmeal with flour for tortillas. We really dont have massa harina here. You could probably make a corn flavored flour tortilla by mixing fine cornmeal with flour, but you won’t get the light fluffy texture of a good corn tortilla. I would not use coarse cornmeal because it will make it gritty. Please can someone tell me where I can buy corn masa? I live near Cebu City Philippines. Not sure if they deliver to the Philippines, but Amazon has it on their US site. I can’t buy it in Japan, so I usually stock up and take it home with me when I’m in the US. Thanks Marc, I will check out amazon, I will be going back to the states in Nov, I had already planed to bring back some then. I am sure there must be an outlet for it here, just haven’t found it yet. Do you have a face book page? Yep, you can click the “follow” menu at the top of the page which has links to all my social media pages. I saw this somewhere – Try El Burro in greenpoint for Massa Harina and good Mexican food. I guess that is in Cape Town? Let me know if you find any – want some in Botswana.